The Insider by Visit Syracuse brings you the scoop on Central New York's travel industry, along with helpful information for meeting professionals. Tourism promotion started off strong for 2016! Visit Syracuse, Onondaga County’s leading tourism organization, hit the road with two tourism partners to promote the region. Visit Syracuse combined forces with one of the State’s largest attractions, Destiny USA and Celebrity Chef Julie Taboulie, at the New York Times Travel Show in New York City. The trio was among 500 other exhibitors, from 150 countries, and shared information with more than 28,000 travelers and industry professionals, over three days. The New York Times Travel Show is a one-stop-shop for travel enthusiasts; providing hotel, transportation, attraction and destination information from all around the world. Destinations like Florida, Rome, Sri Lanka and the Caribbean were in attendance but Visit Syracuse Communications Manager Nikita Jankowski said New York State destinations had an advantage for tourism promotion, due to proximity. 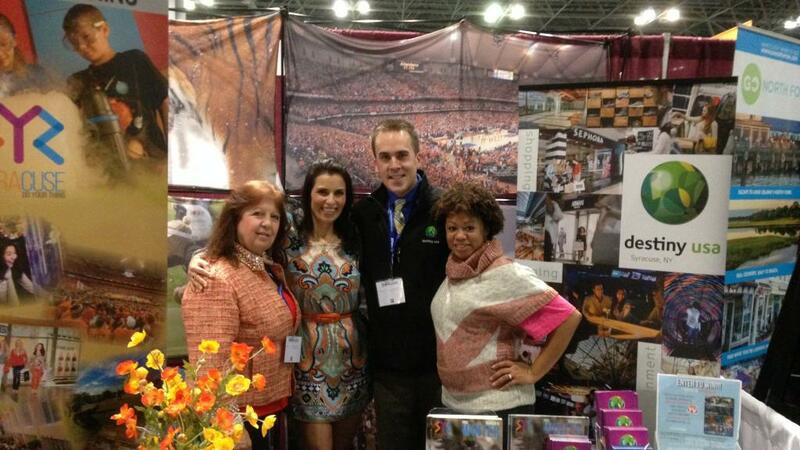 This was the second time Visit Syracuse and Destiny USA partnered for the New York Times Travel Show. They shared an informational booth in the New York State aisle of the show, alongside several other tourism destinations from throughout the State. They also participated in two culinary panel discussions for consumers and media/trade audiences. The Queen of Lebanese Cuisine and Syracuse area native, Julie Taboulie, performed a live cooking demonstration on the Taste of the World – Kids Kitchen stage and will greeted fans with autographs and free giveaways from the booth, immediately after her presentation. Destiny USA brings in more than 25 million visitors to the region annually; making it the fourth most visited destination in the State. Julie Taboulie’s audience of over 90 million viewers spans across the United States and Canada on American Public Television and Create TV. Visit Syracuse helps lead to the production of over $863 million dollars, annually, of direct visitor spending in the local economy. The New York Times Travel Show was held on January 8th – 10th.